Amateur hobbyists are creating home-brew molecular-biology labs, but can they ferment a revolution? It wasn’t until Carlson got back to Princeton and asked a friend that he realized that “Dr Sydney Brenner” was a famed biologist with a knack for transforming the field. He took the job. Within a year, Carlson was working with a motley crew of biologists, physicists and engineers at Brenner’s Molecular Sciences Institute (MSI) in Berkeley, California, learning molecular biology techniques as he went along. The institute was a hotbed of creativity, and reminded Carlson of the scruffy hacker ethos that had spurred the personal-computing revolution just 25 years earlier. He began to wonder if the same thing could happen for biotechnology. What if a new industry, even a new culture, could be created by giving everyone access to the high-tech tools that he had at his fingertips? Most equipment was already for sale on websites such as eBay. Carlson is not alone. Would-be ‘biohackers’ around the world are setting up labs in their garages, closets and kitchens — from professional scientists keeping a side project at home to individuals who have never used a pipette before. They buy used lab equipment online, convert webcams into US$10 microscopes and incubate tubes of genetically engineered Escherichia coli in their armpits. (It’s cheaper than shelling out $100 or more on a 37 °C incubator.) Some share protocols and ideas in open forums. Others prefer to keep their labs under wraps, concerned that authorities will take one look at the gear in their garages and label them as bioterrorists. For now, most members of the do-it-yourself, or DIY, biology community are hobbyists, rigging up cheap equipment and tackling projects that — although not exactly pushing the boundaries of molecular biology — are creative proof of the hacker principle. Meredith Patterson, a computer programmer based in San Francisco, California, whom some call the ‘doyenne of DIYbio’, made glow-in-the-dark yogurt by engineering the bacteria within to produce a fluorescent protein. Others hope to learn more about themselves: a group called DIYgenomics has banded together to analyse their genomes, and even conduct and participate in small clinical trials. For those who aspire to change the world, improving biofuel development is a popular draw. And several groups are focused on making standard instruments — such as PCR machines, which amplify segments of DNA — cheaper and easier to use outside the confines of a laboratory, ultimately promising to make DIYbio more accessible. Carlson started his garage lab as something of a hobby, but he needed to do it without sapping resources from his lab at the University of Washington in Seattle. He bought equipment such as refurbished micropipettes — a staple in any molecular biology lab — and a used centrifuge on eBay. In 2007, fed up with grant applications and eager to spend more time working in his garage lab, he gave up his position at the university altogether. Carlson decided to follow up on work at the MSI. There, he had been part of a team developing a way to quantify small amounts of proteins in single cells using ‘tadpoles’, in which a protein ‘head’ is attached to a DNA ‘tail’. The head was designed to bind to a protein of interest, and the DNA tail could be amplified and quantified by PCR, allowing researchers to calculate the number of proteins present (I. Burbulis et al. Nature Meth. 2, 31–37; 2005). The tadpoles have economic potential, providing an alternative to the standard approach of using fluorescently tagged antibodies, which provide at best only rough estimates of protein levels. But the original formulation was too expensive to commercialize, says Carlson. “If I could use this protein in the garage in a simple way to show that it would work, then hopefully it would be a product that would be useful in a low-tech setting, out in the field or in a doctor’s office,” he says. As Carlson worked, the idea of garage biohacking was taking off. In May 2008, Jason Bobe, director of community outreach for the Personal Genome Project at Harvard Medical School, and Mackenzie Cowell, a web developer in Cambridge, Massachusetts, organized the first meeting of DIYbio at the Asgard Irish pub, up the road from the Massachusetts Institute of Technology. About 25 people turned up. Two years later, there are more than 2,000 subscribers on the DIYbio e-mail list. DIYbio is an offshoot of the open-science movement, which encourages an open exchange of materials, data and publications and has its origins in the push for open-source software in the 1990s, says Kelty. Many biohackers are also keen to tackle projects that involve engineering cells by piecing together new genetic circuits, an approach often called ‘synthetic biology’. DIYbio has picked up both momentum and stigma from this field, which has been alternately hyped and decried as the solution to society’s ills or the nursery for a bioterrorist scourge. The thought of hundreds of biohackers creating pathogens in unmonitored garage biology labs set off alarm bells, and in 2009, the Federal Bureau of Investigation (FBI) began sending representatives from its directorate for weapons of mass destruction to DIYbio conferences. The FBI seems to have taken that message on board, and has adopted what some call a ‘neighbourhood watch’ stance. The approach relies on biohackers monitoring their own community and reporting behaviour they find threatening, says Edward You, a special agent in the FBI’s bioterrorism unit. Carlson’s projects are more advanced than those of the average DIYbio hobbyist, and he has found that the garage-hacker ethos eventually suffered. He says he sometimes found it hard to persuade companies to deliver lab supplies to a residential address. Carlson also wanted his garage back to restore a boat. So, Carlson and his business partner, engineer Rik Wehbring, moved their lab out of the garage and into a small commercial space in 2009. The two fund the space and their experiments through a small consulting firm called Biodesic. Through the firm, they have advised companies on a range of technology issues from biosecurity to designing brainwave-based game controllers. Other biohackers have also come up with creative ways to fund their projects. Several have used websites such as Kickstarter, which allows inventors to post their projects and funding targets online. Visitors to the site make donations, usually small ones, but the hope is that enough visitors making tiny contributions will add up. 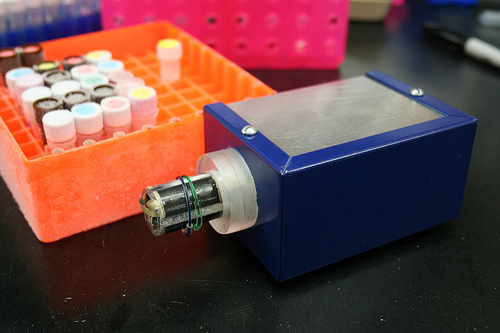 Two California garage biohackers, Tito Jankowski and Josh Perfetto, used Kickstarter to fund the development of a small, low-cost PCR machine known as OpenPCR. They reached their fundraising goal of $6,000 in ten days. By the time their Kickstarter listing closed 20 days later, they had doubled that figure. Another group of biohackers used Kickstarter to raise funds for a hackerspace called BioCurious, based in Silicon Valley, California. They raised more than $35,000. But all of this is tiny compared to the cost of launching an actual business. Joseph Jackson, a self-proclaimed “professional entrepreneur-slash-activist” from Mountain View, California, and Guido Nunez-Mujica, a computational biologist from Venezuela, have teamed up with other hackers to build a portable PCR machine known as LavaAmp, which can be run from a computer’s USB port. The team has poured tens of thousands of dollars into the project, says Jackson, but will need closer to $100,000 to achieve its goal of producing PCR machines that could be used by hobbyists, teachers and by researchers in developing countries. Carlson says that the cost of biological research is decreasing. “The predominant thought about biology used to be that it was expensive and hard,” he says. “And it’s still hard. It’s just not so expensive.” In 2003, he projected the falling costs of sequencing and synthesis of DNA and proteins, and the accelerating pace of research into areas such as protein structure determination (R. Carlson Biosecur. Bioterror. 1, 203–214; 2003). His predictions echo Moore’s law of computing, and some have dubbed them the ‘Carlson curves’. But the curve trajectory isn’t as steep as Carlson might like. He has redesigned the protein heads of his tadpoles, and decided early on that instead of producing the protein himself — an expensive and arduous process — he would pay a company to make it for him. He could either buy cheap protein that was contaminated with other proteins, for about $3,000, or buy clean protein for about $50,000. “There was nothing in between,” he said. He took the cheap route, but found that the batches he received weren’t clean enough to publish his results or start selling the finished tadpoles. The project stalled. Still, five years after taking science into his garage, Carlson says he’s convinced that biohacking has the potential to trigger a technological revolution. “We’re going to see a lot more at the garage level that will produce a variety of products in the marketplace, one way or another,” he says. Outbreaks of Chagas disease are on the rise, affecting about 10 million people living in endemic Latin American countries. The disease is caused by a parasite, and leads to swelling and potentially fatal heart and digestive system disorders in chronic cases. “There are people that suffer but have no way to know if they are affected,” says Guido Núñez-Mujica, a Venzuelan computational biologist. Chagas outbreaks in his home country inspired Núñez-Mujica to find a cheap, portable PCR machine to help diagnose those infected with Chagas and other neglected diseases in developing countries. Portable detection devices are necessary in third-world countries because those infected often live in rural areas. Chagas, for example, is transmitted by triatomine bugs, which live in the cracks of homes in rural or suburban communities. Treating these individuals can be a multiple-day journey: a doctor must travel to the patient to take a sample, return to a laboratory in an urban area, and then return to the patient to present the results and begin treatment. However, with a portable PCR device, diagnosis and care can begin immediately. At the 2008 SciFoo camp—a weekend retreat for scientists, technologists, and writers, and organized by Google and Nature—Núñez-Mujica found four kindred spirits: open science philosopher Joseph Jackson, former Life Technologies researcher and biotechnology entrepreneur Jim Hardy, and engineers Rik Wehbring and Rob Carlson of Biodesic LLC (Seattle, WA). After the conference, they founded LavaAmp to develop a new breed of portable, cheap PCR machines. “Make the device rather inexpensive, make it portable, make it run on batteries if you need to, and make it lightweight. That’s the device that we’re working on now,” says Hardy. Their first prototype weighs only 180 grams, fits in the palm of a hand, and is powered by a USB cable or 4 AA batteries. While most PCR machines are designed for high-throughput, the LavaAmp instrument takes the opposite approach. “You don’t have the need to run 96 samples at once,” says Hardy. “For most applications, that’s not necessary.” While the industry-standard 96- and 384-well formats are really good for screening, says Hardy, it’s not practical for diagnostics purposes. Rather than this high-throughput approach, the LavaAmp PCR device can run 20–25 samples at once. While the initial price will be about $300 to $500, the group’s ultimate goal is to design an instrument that will cost less than $100. “The device is just going to be more or less disposable. You can use it two or three times and just get another one if you leave it behind somewhere,” says Hardy. The first commercial versions are expected to be available in early 2011. Cheaper PCR machines are well on their on their way in their promise of educating the next generation of scientists, diagnosing diseases more quickly in third-world countries, and changing PCR applications around the globe. Although each effort is separate, Jackson from LavaAmp explains that it all stems from a small but growing community attempting to push open-source biotechnology innovation. They all know each other, he says. “So it looks like there is this demand, and at least we’re converging.” He says the next year, when these cheap machines begin stocking shelves, will indicate how people want to use them. Posted by Jim H in LavaAmp. Posted by Guido in Uncategorized. LavaAmp was featured on BoingBoing, one of the most popular blogs in the world. An e-mail I sent to the Science Foo Camp list was picked by David Pescovitz, one of the editors, and highlighted. Thanks a lot to BoingBoing for promoting our product, we are sure the publicity will be useful. Be sure to read the comments section, there are very insightful posts with frequently asked questions and answers from Rob Carlson and Jim Hardy, members of our team. Aaron Rowe, who snapped the jazzy photo of LavaAmp prototype 0.01, featured LavaAmp in an article this morning in WIRED “The First and Last Meeting of Everyone with a Fully Sequenced Genome” promoting and/or reporting on the upcoming Get Conference. Awesome! Posted by Guido in LavaAmp. LavaAmp is a lightweight, portable, and inexpensive thermocycler that can compete with currently available thermocyclers at only a fraction of the cost. Unlike other supposedly portable devices announced in the past, which weigh up to 35 pounds and require a briefcase, LavaAmp fits on your hand, can work on AC/USB power and can perform PCR in 30 min or less. LavaAmp will be sold at only a fraction of the price of current technology, enabling the use of PCR in areas where previously it was too expensive, making possible new applications and unleashing the power of this technique, that 25 years after its creation still has to deliver its full potential in diagnostics, food safety, education and biosecurity.